The Bad Idea Blog | Science, Skepticism, and Silly. Critics welcome. I know I’ve been silent for a while, but I have a good excuse… which I won’t tell you. Suffice to say that the end of the election has something to do with it. I almost drove off the road. Leave alone the fact that that last comment doesn’t make a lick of sense politically (yeah, all us Sarah Palin-loving atheists! ), but how exactly does your perception of reality become so twisted that you can possibly work waxing poetic against the evils of bigotry into the same speech that you smear non-belief and non-believers? Isn’t that a form of bigotry? Anyway, I shouldn’t too hard on the woman: maybe, like so many others, words fail her in what is a tremendously emotional time. It gets even more bizarre when you consider what “suspending his campaign” means to McCain. It means, apparently, that he will temporarily, for about four days or so, stop spending money on television and radio advertisements. Because, you know, having staffers making media buys distracts him from finding a nice quiet spot to sit down and think hard about the economy. The current economic meltdown (Katrina on WallStreet as I like to think of it) is not exactly the Cuban Missile crisis: it’s a long-term structural problem that’s been a long time coming and will take a long time to shake out. The various bailout plans being floated around look like anything from reasonable gambles to insanely scary power and money grabs, but so far McCain’s camp has failed to explain how having him and his campaign stomping around in Washington and giving press conferences is going to help. Obama’s offer for the campaigns to take the issue off the political table was something that McCain should have lept at, frankly: it could have helped McCain look both nobly bipartisan and maybe given him some cover on an issue that obviously hurts him (a champion of deregulation floundering in a scandal of corruption, fraud, and abuse). This move, on the other hand, makes him look utterly absurd: even his most dogged defenders are admitting that the move looks more like a gimmick in response to his declining poll numbers than an actual substantive response to financial crisis. We all know that the hyper-media age is a brave and bizarre new place, where “meta-” counts for far more than meat. Marc Armbinder has the latest dispatch from the front lines: Playing The “Playing The Race Card” Card. Once upon a time, the rules were simple. Republicans, who usually have to scramble to find one or two African American faces to highlight in their conventions (including having to resort to using stock photography of them), have the temerity to actually include African American politicians like, say, Barack Obama (coincidence? I think not! ), in their political attack ads. Someone, somewhere (and just about anyone anywhere will do) complains that the usage was racist: meant to subtly play on racial discord and feelings of otherness. The Republicans would then lean back, hands in the air, eyes rolling, and accuse all Democrats and Presidential candidates everywhere, whether they had actually complained or not, of “playing the race card.” This response is devastatingly effective, primarily because it allows the very same people who definitely aren’t moved by subtle racist appeals to have the same response to the ad/controversy as if they were moved by them. You see, they don’t hate African Americans, they just hate how those African Americans are always whinily pointing out that they are African Americans, and having the temerity to exist in a universe in which some people find some things potentially racist. Wait, did I say that the rules were simple? What I meant was that they were totally insane. But anyhow, now we have another meta-layer to add to the whole thing: as Armbinder points out, there’s a possibility that Republicans could now be deliberately using African Americans in their ads so that they can start off the “race card” chain. Case in point: a newly minted (and laughably implausible) attempt to link Obama for the current financial crisis by pointing out that he knows former and talks to Fannie Mae employees. Specifically, the ad uses a supposedly sinister African American as its example, despite the fact that a former Fannie Mae CEO, and noted white male, is far more closely connected to the Obama campaign. And then there is a sad, obviously pained, white woman thrown in for good measure. Is the ad racist? Ye gods, I have no idea anymore! But here’s the thing. It’s very hard to imagine the McCain ad-meisters who came up with this ad not having a very conscious discussion over how the ad would be perceived, and whether it would spark accusations of racism, and whether that would be politically advantageous. Dial us up a white granny and see if they’ll fall for it! So are non-racist guys who consider exploiting people’s non-racist anger over allegations of racism… racist? Ye gods, I still have no idea, but now I have a headache! It probably shouldn’t come as a surprise to anyone versed in psychology, but more and more research is supporting the idea that political falsehoods are effective: even if they are later exposed as false. Whether you be Democrat or Republican, the emotional effect of a compelling narrative or juicy smear seems to remain even if its decisively debunked. While we all seem to form knee-jerk attitudes initially because of certain claims, but we don’t base the attitude on the continued veracity claims: the attitude stands on its own with out without the survival of the supporting claims. In a paper approaching publication, Nyhan, a PhD student at Duke University, and Reifler, at Georgia State University, suggest that Republicans might be especially prone to the backfire effect because conservatives may have more rigid views than liberals: Upon hearing a refutation, conservatives might “argue back” against the refutation in their minds, thereby strengthening their belief in the misinformation. Nyhan and Reifler did not see the same “backfire effect” when liberals were given misinformation and a refutation about the Bush administration’s stance on stem cell research. Kevin Drum thinks that this effect may have something to do with the carefully celebrated disdain many conservatives have cultivated for experts and media sources in general, and there may be something to that. Drum also notes that the source of the refutation didn’t seem to help either: conservatives seem more likely to believe a politically convenient falsehood even if it’s FoxNews that’s trying to correct the misinformation. Liberals will no doubt find this research as yet more evidence that their counterparts are indeed stubborn science-haters who prefer ideology to reality (conservatives may, ironically, respond by denying the science behind this study). But before we go whole-hog down that route, I can think of one major explanation for the results that Drum might have missed, and for obvious partisan reasons. Simply put, this research might not be evidence of conservative pigheadedness: it could just as easily be taken as evidence of legitimate conservative cockiness in the face of consistently lousy critics. That is, it could be that, in the actual real-world experience of most conservatives over the past few decades, prominent “refutations” of ideologically pro-conservative claims really have turned out to be wrong a lot of the time. Perhaps even so much that encountering strong objections to such claims is itself a good statistical predictor of their veracity. This isn’t necessarily a rational reaction on a case by case basis; it doesn’t have to be. Like any Pavlovian mechanism, what matters is simply its general effectiveness as an association over time and experience. A knee-jerk “backfire effect” response may not make conservatives look very good in a controlled situation in which the claim is already known to be wrong. But it might be a reaction that’s served conservatives pretty well in everyday political life. Thus, what may be at work here is simply a difference in actual historical experience. Refutations of claims that liberals like may simply have turned out to be valid more often than the refutations of claims conservatives like. And because each group has had different experiences, they’ve developed different knee-jerk mechanisms for how they process a refutation of a politically convenient claim. Of course, this explanation would require you to basically accept that, in practice, conservative claims really are right more often than liberal ones. Or, at least, that critics of core conservative claims tend to be a lot sloppier and untrustworthy than critics of liberal claims. As someone that leans towards the liberal side of things myself, my own knee-jerk reaction is to find such possibilities absurd: how could our “reality-based community” be less reliable than… than… them?! The problem, of course, is that I’m obviously too biased to subjectively sum up such a broad and comprehensive balance sheet of overall trustworthiness. Nor can I think of any immediate way to test a partisan bias in “accuracy” empirically. But I do know that it’s at least a possible explanation for the highly partisan nature of the “backfire effect” that the researchers observed; it’s one which I can’t, as a good social scientist, immediately discount just because I happen to get all worked up about McCain’s latest campaign ads. And it is an intriguing thought in any case: that the individually irrational behavior of a certain group towards criticism could itself be evidence that their ideological red meat is generally more accurate in the face of criticism. Oh good grief. If you’ve been following drudge and a host of conservative pundits, you may have noticed an odd story crop up, seemingly out of nowhere, claiming that Sarah Palin had been denied a place on Oprah Winfrey’s show. The story then turned into drudge’s usual fallback: there had been anonymous debate behind the scenes as to whether Palin should be invited onto Oprah’s show. The whole thing appeared to be a bid to win Palin a free media spot. But far from letting the sneaky bid drop once Oprah herself had denied the already substance-free rumors, people are actually serious about this. As in, they’re actually acting all outraged about it. The Florida Federation of Republican Women is even calling for an Oprah boycott. The whole thing has a canny, stiffly staged air: an embarrassing spectacle of joiners playing to a campaign script, rather than people doing anything on principle. Oprah, for her part, seems to have a very reasonable and fair principle: no active, headline candidates during the campaign. She openly supports Obama, but since declaring so, has not invited him or his surrogates on to campaign. I don’t see any unfairness there. I see a media figure with a laudable policy of neutrality. Oprah owns her own show: if she wanted to use it to promote Obama constantly, she could have (within the limits of FEC regulations). But she hasn’t. We’re 60 days out from the election. Sarah Palin is apparently going to spend the next two weeks in an undisclosed location, refusing questions from actual reporters, rejecting what would also be free media spots on countless news programs… but she’s somehow entitled to what amounts to a free campaign spot on Oprah’s (private) television show… when no other candidate, not even other female candidates like Hillary herself, is given such airtime. And that’s… unfair? Especially biased? Nope. It’s all an act or profoundly cynical posturing: another out of the blue bid for attention. And the fact that people can promote it with a straight face, let alone use bombastic rhetoric about entitlement and desert, is simply astonishing. 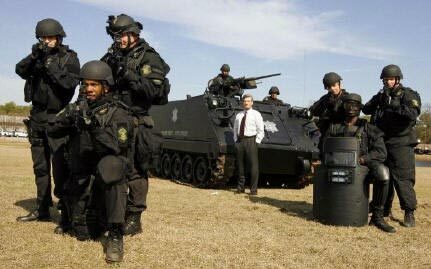 Missed this story when it first broke, but can you think of a reason for a local police department to have an armored personnel carrier with a mounted 50 caliber machine gun turret? Can you imagine them actually using such a thing in a residential neighborhood in the U.S.? Probably not. The Sheriff claims that the vehicle will “save lives” and reasons that when “something like this rolls up, it’s time to give up.” I’m all for the police being appropriately armed, but give me a break. First of all, this thing is not going to have time to “roll up” unless the police are either conducting a pre-planned raid, or having a long standoff. And in either case, I very much doubt that an APC is going to intimidate criminals any more than twelve guys in riot gear and machine guns already can. .50cal machine guns are for closed firing ranges and war zones: places where you either want to have safe, human-target-free gun fun, or else turn real human beings into hamburger. They don’t belong in residential or urban police operations for anything short of Die Hard. But wait: what if I told you that it all made sense because… because… Jesus! Sheriff Lott stated that the name selected from the entries will be “The Peacemaker” because that is the APC’s purpose and the bible refers to law enforcement in Matthew 5:9 “Blessed are the peacemakers: for they shall be called the children of God”.